As a result of my successful upgrade at the Institute of Education, the feedback I received from my upgraders and advisors, and the results and adjustments from my pilot study, I have been rewriting a bit of my thesis. A lot of the rewrites have been to the introductory bits as I try and establish a firmer Korean context for the activity I am generating data from and analyzing. However, I have found it interesting enough, as I described in my last post, to revisit sections as they stood when I first started writing them and now. While mobile learning interactions are highly collaborative and contextual, both complimentary and challenging to formal education, they are incredibly complex exchanges that require further research. A good place to start is to define what is meant by mobile learning. For the purposes of this research proposal, mobile learning will include any learning that can take place without regard to physical location. Mobile learning, in this definition, assumes that the learner is mobile, rather than the technology (Sharples et al, 2005). While mobile technologies are certainly important in this definition of learning, they are not deterministic to the process of learning for the learning itself. They are devices of connection to information, to community, to additional layers of context and they can be appropriated as needed by the learner as they move between settings (Sharples et al, 2005). Pragmatically, they are also the technology of greatest impact in developing nations and therefore offer potential for augmenting learning in these areas. Generally, the type of learning found via mobile devices oscillates between formal and informal, between independent and collaborative learning. Mobile learning applications can include classroom response systems, participatory simulations, and collaborative data gathering, among others (Roschelle, 2003). These applications revolve around the introduction and contextualization of learning at a novice level, but very few applications and projects target existing expertise or expert level disciplinary practice. According to Frohberg (2009), these applications do not support expert level learning as they have a lack of tools to reflect and process their knowledge, to record and share their insights with others, and to create material to work with a self-reflecting or cooperative process (322). These are all critical components of meaning-making in the Humanities. This poses both an opportunity and a challenge for the marriage of the Humanities in higher education and mobile learning, one that I am motivated to address. I was emphasizing and much more interested in the type of learning that could possibly take place through the conduit of mobile technology. I was much more interested in analyzing these spaces as a means of understanding the subsequent design experiment that I was sure was bound to follow. However, somewhere along the way, the Korean context itself, its norms and contours and sociocultural particulars, took over my interest. I became much more interested in presenting the Korean context itself, its unique philosophical inclinations, its internal conflict in higher education (a Confucian model of learning and thinking mapped onto a Western university system mapped onto Western outputs). In short, I wanted to accurately present Korea itself to my academic community, to see how Koreans make meaning, how Koreans use mobile technology to augment or mediate that meaning, what all of this means to them. 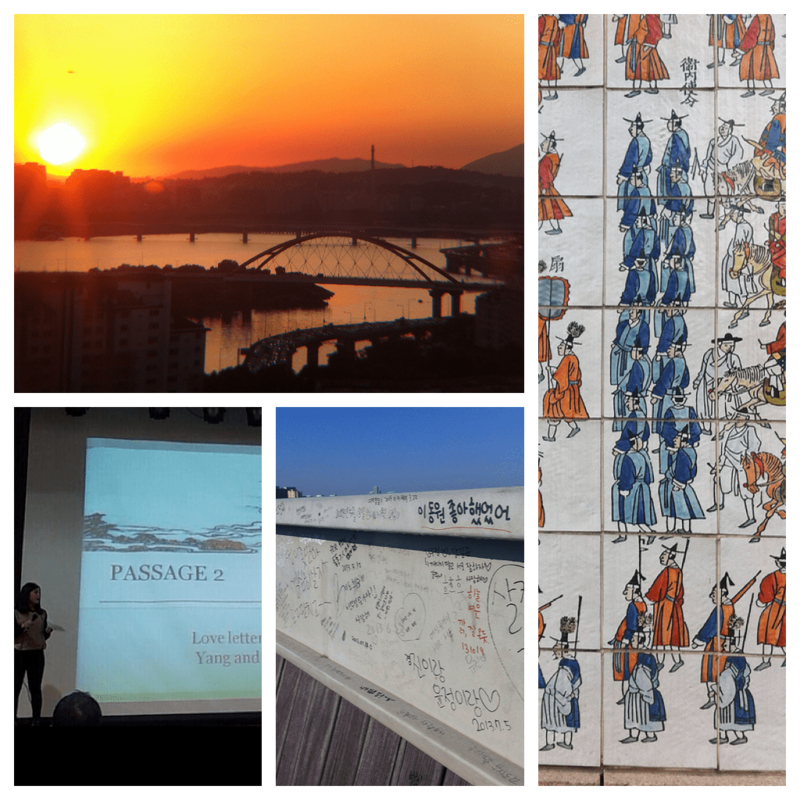 I wanted to present how the Humanities in Korea are construed and constructed and how that can be (occasionally) at odds with the Western model of the Humanities. How we need to make room for both because alternative models and modes are the lifeblood of resilient systems. It became much more personal. So the newer text on motivation reflects that. My motivation for this research is an aggregation of factors, but primarily there is an effort to bring attention to the mobile practices of university students in Korean higher education, to provide greater links between the Humanities and mobile learning design and research, and to develop methodologies that reasonably follow the student throughout their learning spaces via mobile technology, from formal to informal and from socialized to individualized (Park, 2011). Specifically in the Korean context, this work will build upon the work of Hjorth, Haddon, and Kim and their work on mobile practices in informal contexts in Korea; these authors have provided a template of a methodology that I hope to expand to include formal learning contexts as well. I believe there is a dire lack of research in these areas that I hope to address. I focus on the Humanities specifically to see if non-scientific disciplines, those that favor representational/ impressionistic, dialogue-based communication and learning structures, can be accounted for in mobile learning. The Humanities emphasize dialogue, interactional states, multimodality, and iterations of coming to know. This is more complex than is often the case with linear modes of scientific proof and knowledge I also hope to explore what role non-textual modes, which I believe mobile technology privileges or makes more readily available, has in the participation and learning process of the Humanities in Korean universities. In this thesis, my motivation is to explore the role of mobile media as a means of meaning making and disciplinary participation in the Humanities, and to explore the social circulation of this media in the participants’ respective communities and its effect of identity and participation. However, there is a more immediate need in this research. The Korean Humanities in higher education have been mitigated to second class status (as is the case in much of the world) in deference to their science and social science counterparts. This de-emphasis mutes a distinct voice in the broader Humanities community and a unique vehicle for illustrating the unique constructs of Korean and Asian philosophy and modes of meaning-making. Korean Humanities are unique containers for Asian philosophy (representing contextual mixes of Buddhism, Confucianism (Neo), elements of indigenous thoughts, etc.). They are, simply, very different structure than Western Humanities. In the Korean context, Humanities is the study on the original and ultimate truth. The Humanities, in the Korean context, is the blending, rather than the dialectical isolating, of the whole. If mobile learning and technology can invigorate this practice and bring it to a wider audience, then I am motivated to contribute to that process. I doubt I will use that quote discussing the differences in the Humanities in the East and West, but it is important. It frames the approach in Korea to learning and what an expected outcome should be to that learning. Blends, wholes, aggregations, becoming one, balance between the grand and the trivial. While my research doesn’t directly address the particulars of this philosophy, I am now motivated to present it accurately in the context of what I am observing and analyzing. It isn’t a curious plaything or side effect of an exotic culture; it is a reasoned voice, an established one. So motivations change and our research changes with them.